China's top dog show enthusiasts are just like Americans and AKC shows - they love their dogs, grooming them and showing them off. The date of the class in Beijing is from June 22nd to the 26th, 2001. We instructed in handling, Show rules and regulation of each different system i.e. FCI, AKC etc etc. 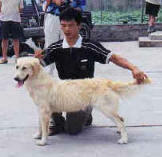 We also taught basic obedience, dog behavior as body language to understand your dog and what it is trying to tell you. I think our dog is much more cleverer than any of us. The last day of instruction we have a mini show to firm the handling course, so that we know they understand instead of the usual paper work test. We have the presentation of certificates and then the idea that we are going to have a handler competition for October show. Then we have a day in the city and the discussion of the matter of CCA which is the cat association of China. I am asked to handle their foreign dept as well as the Beijing pet magazine as their consultant. We desperately need more material from Americans concerning shows in USA and about dogs so that the Chinese will learn quicker and more correct direction. They are eager to learn but we have so little tools to teach. 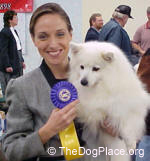 We need to learn grooming and detail about breeds we are importing. TheDogPlace is very good to teach but most do not read English so we print it out. Can you have more people write about how to show and groom? We are then off to Shenyang where we were met by the principle of Shenyang police academy. He took us by car to the State Hotel where all the Presidents of countries will stay if they are in town. We stay for 3 days there but have to move the last night due the fact that the president and other countries diplomats were going to be there for conference. They don't have enough rooms. During our stay in Shenyang, we have managed to get the State Police, Shenyang Kennel Club, Shenyang city gov't and NASA to set up a show for mid October. We left them to get on with the paper work and red tape. Then to Dalin, the city that has the best seafood in China. Unfortunately, not this trip as it was a conference after a conference with many different groups as they have set their show date to that of Beijing. This could cause a fight among two previous friendly associations due to the entries for the shows could cause competitions as they are very close distance to each other, only an hour by plane. We saw even their sponsor which is the company that helps the trade association of China to develop shows events like the fashion etc. The show event is supposedly to have the presence of two vice president of China for its opening. We never left our hotel room and the dinner conference room of the hotel for two days. After Dalin, we say goodbye to the north of China. We went south, where we opened the biggest petshop in the south. then we open another Grooming course in our office in Zhuhai. We also discussed two show events in the south with two different association in Canton. Then I met with a fellow student who also study under Kazu Igarishi. Mr Mann is the son of a Taiwan general. He is a keen Pomeranian and German Shepherd dog person who does not seek to sell any of his dogs or puppies commercially. He went with a doggie friend to Chengdu where he is appalled by condition of the dogs that are for sale in petshop there and left to find me. I should have said I told you so to him but refrain as I did not want to go there. Sometimes we have to wait for the right moment to do things. Then back to Zhuhai where Mr. Mann teaches the students there and he is amazed at the quality of the students there to the ones in the petshop in Chengdu. The students in Zhuhai also opens petshop or is going to open petshop in their home cities ( and we have also one student from Chengdu for this class). Mr Mann is very pleased at the difference of attitude and the willingness to learn. As example, here is a photo (right) of a young man who follows us from Beijing to learn. Everyone is very eager to learn how to do the good things with their dogs. We have a belief in NASA is that nothing in this world is free, especially knowledge. Mr Mann left for his judging appointment in Indonesia and I went home to Hong Kong. Only two students have failed to make the grade. We have to give them pep talks and how to proceed and learn and then redo the test the next time to get certificates. Then I am off to see members of NASA within the province of Canton which took me at least 3 days. and many many dinners and lunches. There are plans to set up the first quarantine kennel in China and another training academy and office for NASA. NASA is going to have a day to answer all question to Hill's members concerning dogs and cats. Hill's member is getting to a total of 2000 + and hundreds will attend that function.